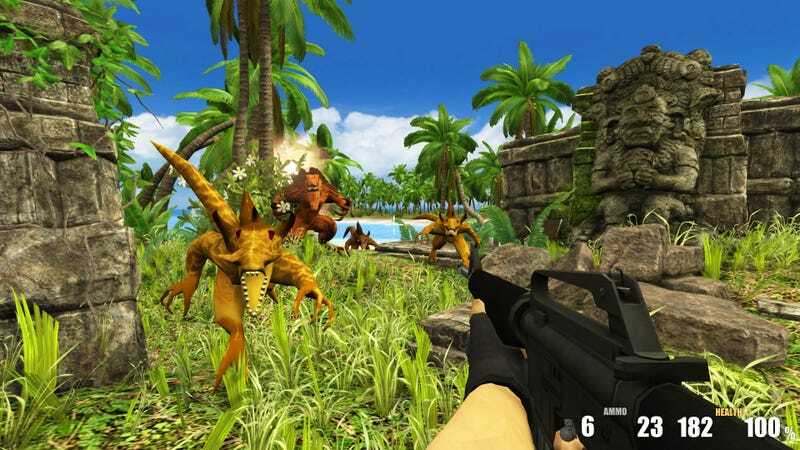 Alien Wasteland is a rudimentary looking first-person-shooter made by a single person. It looks pretty darn different from Wasteland 2, the gritty strategy game from inXile Entertainment. Nonetheless, the developer behind Alien Wasteland was recently issued a cease and desist from the creators of Wasteland 2. Alien Wasteland’s new name is Action Alien after nXile said it infringed upon their “Wasteland” trademark, developer Devdan said in a blog post. The game’s name is now officially called Action Alien on Steam. This is Wasteland 2. This is not Alien Wasteland. I repeat, this is NOT Alien Wasteland. Ismail appreciated inXile reaching out and asking for a change prior to involving lawyers, which appears to have happened with this smaller developer, too. With Alien Wasteland and Wasteland 2, however, it seems a stretch to argue there’s all that much overlap. But that hasn’t stopped silly legal posturing in the past. Remember how Bethesda told Mojang it couldn’t call their collectible card strategy game Scrolls because it might cause confusion with Elder Scrolls? This is Scrolls. This is NOT Elder Scrolls. Also, this is NOT Wasteland 2. Furthermore, this is NOT Alien Wasteland. That was ridiculous, too, but Mojang hired expensive lawyers to figure out a solution with Bethesda, which apparently involved them promising to not make a competitor to Elder Scrolls. It sounds like Alien Wasteland had to drop the “wasteland,” no questions. The developer behind Alien Wasteland didn’t respond to my request for comment. “This is just one of the many headaches in game development,” he wrote in a blog update.